Vitamix – You had me at Hello …..
On a Sunday afternoon when we should have been doing more exciting things we found ourselves once again pushing a wonky wheeled outsize trolley around the cavernous Costco warehouse in Reading, purchasing a 6 month supply of discounted high quality triple ply loo paper. Despite only two of us living at home now we still cannot resist bulk buying bathroom and kitchen paper goods from Costco as if there were still the four of us residing there and the imminent threat of some bowel turning superbug about to do its worst hanging over us!. We stood transfixed by the salesman’s patter – this is how Adam felt when Eve tempted him with the apple – it was irresistible. This gadget was going to revolutionise our lives. I am gadget averse, what I mean by that is I don’t like gadgets out on display and I have little space in the cupboards to accommodate anything else. My kitchen is traditional and without the retro styling of Kitchenaid I just aint’ interested HOWEVER I was slowly being seduced into thinking that this was worth the sacrifice and with one eye closed and head slanted at an angle the Vitamix does look a little vintage, though the styling is more akin to a 70’s TV Space series representation of the Future than my preferred 50’s look! So as we filled ourselves with delicious salsa, a hot Thai soup, a green kiwi smoothie, almond milk, cashew butter and frozen berry yoghurt we stood transfixed, the sales assistant doing a metaphorical dance of the seven veils, revealing the hidden bounties of The Total Nutrition Center. We were coaxed in closer with a tray of amuse bouche and through each reveal, a little history, a funny anecdote followed by another mouthful of deliciousness. How to create ‘mock’ lemongrass – an apple and half a lemon whizzed up in the Viatmix with a little water. Genius. Then the techie stuff, the explanation of Centrifugal force..the intense spinning of the blades creates friction that imparts heat to the liquid and in less than six minutes HOT SOUP! And you don’t even have to peel the fruits and veg, could this get any better? Mesmerised we swayed to the demonstrators melodious repartee, enthralled and then STRIKE! A One Off TODAY Only Offer Madam, Sir …. blah, blah blah – the rest was irrelevant. Mr VitaMix sales rep, you had me at Hello ….. The chatter home in the car was full of how we would wake each morning to a delicious green juice full of wholesome fibre and plentiful nutrients, perhaps a high protein snack at lunchtime of a nut-butter spread on crispbreads and then how many times per week we could now go to the gym, straight off the train at 8pm, gym by 8.15, 45 minutes in the gym and home to delicious hot soup full of goodness within 10 minutes of walking through the door. Green smoothies for breakfast, entertaining with home made salsa, soup starter and then frozen yoghurt for pudding … I will be a Domestic Goddess worshipping at the shrine of Vitamix – and thin and healthier to boot. Day One of the new us ….. managed to not quite get up early enough to do a green juice and besides it was Monday and there were only 2 apples, a lemon and an ageing plum left in the fruit bowl. Not to worry, I could pop into Wholefoods in Kensington and pick up some delicious Organic vegetables for the smooth velvety soup I would be making post-gym session tonight. So at the end of the day, feeling virtuous at starting the week I skipped through the door with my bag of mixed root and leaf vegetables ready to create. In they went, carrots, leeks, onions, celery, a little spinach, parsley, coriander, a little salt, pepper and garlic to flavour and cold water. And GO! The noise of the machine is LOUD, loud enough to require lip-reading skills when in action. Of course in a Costco Warehouse with its plane hanger dimensions this is not a problem, in my small suburban kitchen it is but we shall presse (presse, geddit?) on. Six minutes feels too long when you are suddenly ravenous, four or five minutes into the processing and the machine is beginning to steam and a quick touch of the polycarbonate container confirms the soup is indeed getting hot. Poured into deep soup bowls we sit to eat our healthy, nutritious, fat free supper ….. bleurgh. I WAS NOT expecting that …. it is VILE, throat closingly, gag inducingly VILE but HOW? I like ALL those vegetables and herbs and combined they would normally create a delicious, smooth vegetable soup with the aid of my now defunct Braun MultiQuick and 30 minutes softening in olive oil. By now tired and emotional caused by a massive blood sugar slump I throw the last remaining carrots and coriander into the Vitamix, now everyone loves carrot and coriander soup, right? what could possibly go wrong … so six minutes later we sit down again, less enthusiastic than before but nevertheless driven by hunger, keen to bolt it down. Well, it wasn’t inedible but frankly Covent Garden Soup Company turns out something far superior than this bitter concotion. And the texture, the force used seems to emulsify the liquid somewhere along the line and what is poured out has a strange viscosity that once in the mouth feels ‘slimy’ and not unlike egg albumen. But we ate it anyway. Deflated we went to bed hungry and feeling a little bit like we had fallen prey to a slick sales pitch (again! we have a steam penguin, shirt flip flap folder and numerous miracle household cleansers residing in various cupboards around the house). On reflection, I suppose when you slowly soften vegetables in oil to make soup in the conventional way, you release the vegetables natural sugars which gives a softer, sweeter taste in the mouth and a quick jooooosh in a blender affords you the texture you want rather than the cloying potage I had created. Since then I have reverted to peeling and softening my vegetables in the traditional way and of course use my Vitamix to blend it to the texture I require. Now I am no longer commuting to London for 5 hours a day and have rescinded my gym membership, preferring a brisk walk in the morning to keep me fit I finally have the time to watch the instruction video and read through the manual, when searching for where I had gone wrong, an online forum posted RTFM – Read The Freakin’ Manual, should have done that, I didn’t. 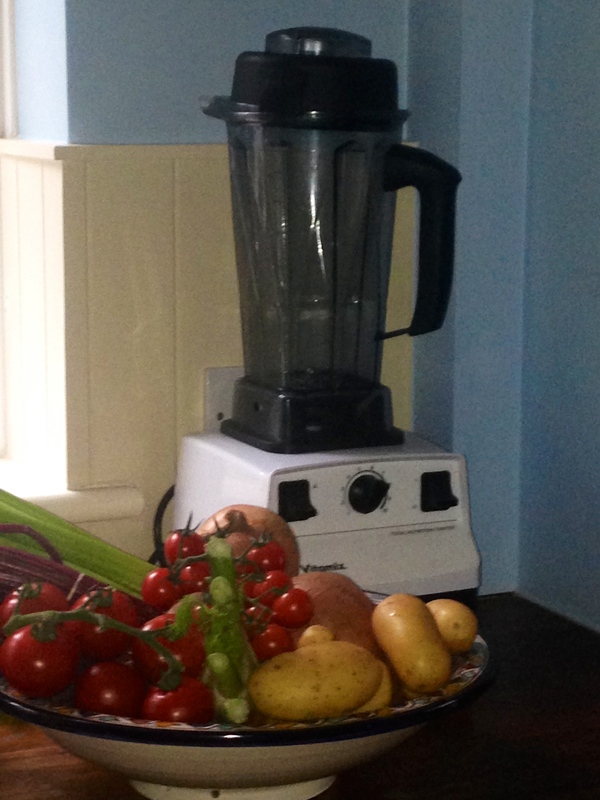 I am determined to master the Vitamix, but until then it is my most perfect, noisy, indestructible ……..food blender.